Steve Reich: Less is more | Tape Op Magazine | Longform candid interviews with music producers and audio engineers covering mixing, mastering, recording and music production. Steve Reich is a composer of music that gets loosely lumped into the classical genre. But make no mistake-his music will never be mistaken for Mozart, Beethoven or Bach. 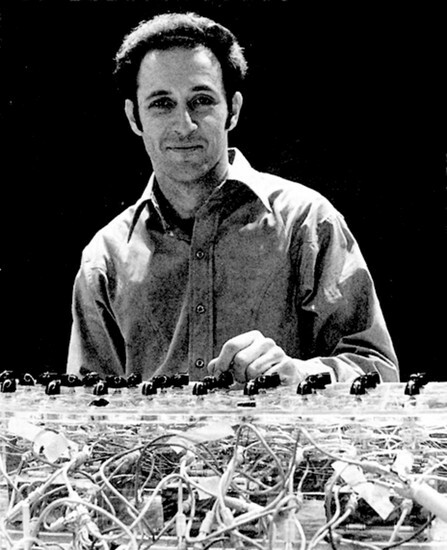 At age 62, Steve Reich's music is contemporary enough that he's been sampled by the Orb and has been honored by a remix CD from the likes of DJ Spooky, Howie B and a lot of other DJ types. He first made a name for himself in the mid 60's as part of a group of musicians that were later labeled 'Minimalists.' His early pieces like It's Gonna Rain and Come Out used two tape recorders to play back two identical tape loops that slowly went out of phase or re-generated into new sounds. This may sound kind of gimmicky or simple, but you really have to hear it to experience the depth and complexity within the minimalism (pun intended). This begins to explain why DJs and current artists experimenting with electronics are inspired by his music. He went on to further explore these ideas with live musicians and by the mid 70's he had already moved beyond the strict confines of minimalism and has since explored many tonal and instrumental palettes including opera and compositions for full orchestra. Last year saw the release of the 10 CD boxed set, Works 1965-1995, of all his music up to that point. Steve: Did it at home. I had very minimal equipment. In those days when I did "It's Gonna Rain," I had a Viking stereo deck and two Wollennsack monodiscs, which are like the first tape recorders that became commercially available in the '50s. It was pretty poor equipment from our standards. But the lesson is, if you do a good job, if you maximize your signal to noise ratios and take the best care as you can, then the grittiness and the graininess of those pieces are a plus not a minus. In the 70s and the 80s I worked a lot with the multitrack machines on half-inch tape. I had a Teac 8-track machine which I did Music for 18 Musicians on. I've been using that equipment and then more recently of course, everybody's gotten into computers and I'm no exception. I use a Macintosh and I use Finale and I've also used Digital Performer and been able to integrate digital recording into that. When we go into the recording studios, we've gone into large studios and we've gone into small studios, basically recording live with, usually, almost no over-dubbing, unless you're talking about a piece like Electric Counterpoint where it is an overdub piece. But, Music for 18 Musicians was recorded in a pop studio in Paris for ECM. We had a little separation between the players. The room was basically dead and the reverb was added later. More recently, City Life was recorded at the Hit Factory in New York, which is a very big studio, but pretty much the same way. I think the idea of doing it yourself, which has been around the recording world for awhile now, is a very healthy one and a very, very good one. The good news is phenomenal equipment is increasingly available at a relatively modest price, and that keeps on improving. So there's gotta be reason to believe that people can produce albums of rather excellent quality in their homes. It seems that the bigger studios are becoming less the norm. Most music that people hear, except for the huge pop hits with tons of money thrown at them; a lot of it is done in smaller project studios. Exactly. You master onto a DAT, which is a small item and anybody can cut CDs now. The whole thing is just getting easier and easier to accomplish. How did the remix CD come about? Well, what happened was this guy in Japan by the name of Shiro Nakishima who works for Nonesuch in Japan and knows some of the Japanese remix- ers Kanishi and Nakamura. I guess it was about '96 and he said to me y'know these people are really interested in your music. You oughta do a remix album. And I said, 'That's an interesting idea. Why don't you see if it can work.' It turned out that there was a lot of interest amongst the DJs in doing something like this and they began sending stuff in and we all began listening to it and here it is. I'm very pleased with it. You know it's not really my music. In a sense, I've done nothing. I just said yes as opposed to saying no. But what's nice to see is what I've called poetic justice. I mean, when I was a 14 years old I used to go to Birdland which was a big jazz club in those days and hear Miles Davis and the drummer Kenny Clark and later on I used to go to hear John Coltrane innumerable times when he was doing what was called Bolo jazz. A lot of music, very few chords. This had a huge affect on me. This is like 1950s, 1960s. Then, in the 1970s in London we gave a concert at Queen Elizabeth Hall and at the end of the concert, a guy came up with long hair and lipstick and said, "Hi. How are you doing? I'm Brian Eno." Shortly after that David Bowie came to the performance for Music for 18 Musicians that was given at the Bottom Line Cafe in New York when the record was released back in '78. And it was kinda gratifying to see, well gee, I was the kid who was listening to these jazz people and here are these rock n' roll people who have been interested in what I'm doing. Well, now cut to about seven years ago and I'm in London and someone says, 'Hey, have you heard the Orb?' I say, 'What's the Orb?,' and he said 'Well, take a listen to it' and he gave me Little Fluffy Clouds. It was their big hit and it's got about 30 seconds of Electric Counterpoint in it. This is what's going on in the pop world now and that was my first exposure to what's called dance music or whatever you want to call it, Electronica. Then, this project happened and I began to hear what people were doing further with my own music and it's another generation of people who are from the pop world finding what I've done of interest. And that's very, very nice. There are composers obviously who have been influenced by what I've done, both here and in Europe and it's nice to see that within the pop world too, especially since I've received stuff from the other side of the line. So as they say, for me it's poetic justice. I've read in some interviews that you tend to shy away from the minimalism tag. But, one of the things I really found fascinating about your music is that you created this really beautiful, complex music with, I suppose you could say, a lot of limitations and a minimal palette. I found that had a lot more meaning beyond just music that could be applied to a lot of different arts in a more general sense. At the time I was a recording engineer and producer and I drew an analogy between your music and making a pop/rock record. In making a record, you can follow every path and try every single option, but sometimes the best records come from not doing just that. From just limiting yourself to a degree. I'm wondering how did you find your path to think in those terms? Or do you even think in those terms? I did think in those terms but those terms have changed. What you're talking about happened originally between 1965 and 1976. What happened with me is that as a kid, I was very interested in jazz and I also later on became interested in non-western music. I heard Balinese music while I was at Cornell through William Austin, a professor of music I studied with there. When I was a graduate student studying with Berio in Mills College in California, we went down to the Ojai Festival outside of L.A. in the summertime in 1963, and there were a number of American composers down there holding fort. Gunther Shure, an American com- poser who was very interested in jazz and was writing a book on early jazz, said to us, "Hey I discovered a book that has complete scores of African/West African music in it." I raised my hand and asked what was the name of the book and he said, "Studies in African Music by A.M. Jones." So, I went back to the Bay Area, where I lived, and took it out of the library in Berkeley. I was amazed to see that it was made up of repeating patterns so the downbeat did- n't coincide. This had a lot to do with the tape mixes I was fooling around with at the time. I was also listening to John Coltrane, as I was mentioning to you. John Coltrane, what became interesting to me about him and to a lot of other people, was that he could do a piece like Africa Brass, which was basically 30 minutes long, and if you asked another musician, "Hey man what are the changes?" they'd say, "F." And I say, "No, man. What are the changes?" and they'd say, "F. F for 30 minutes." So, what was happening around then that I was getting interested in, was what you could call harmonic stasis- not having a whole lot of harmonic change. You found this also in the pop world. I don't know it you remember back to Motown, but Junior Walker had a big hit tune called Shotgun, in about 1964. Basically the bassline just went [sings bassline] and it just went like that over and over again. It had no "B" section, no break or release. A lot of different music from Coltrane to African drum- ming to Balinese music to Junior Walker, were all honing in on the same direction, so it wasn't miraculous at that time. You would have Terry Riley and Lamonte Young and myself and later Phil Glass, and much much later John Adams, coming out of this kind of musical nexus of tastes, coming from the pop world, coming from the jazz world and coming from the non-western world, but not coming from the classical world. The classical world at that point was just the opposite. Totally chaotic, no harmonic center whatsoever, with music com- ing out of Schoenberg and more recently com- ing out of Barry Ogle. I was studying with Stockhousen, and John Cage. So I felt much closer to the music that was coming of non- western music, jazz, and Motown. That led me into the direction which I eventually followed. After having whittled things down to an extreme, working with 5 or 6 pitches for 20 minutes in Violin Phase or Piano Phase or even Drumming for a hour, I then began to think what if I introduced some harmonic movement here, and the result is the Music for 18 Musicians. From there, there's still further accommodation, if you like, of traditional western things, so that when you get to Tehillim, you've got a four movement piece with a Hallelujah in D major at the end and the Desert Music is for large orchestra and chorus. So, yes the word minimalism is accurate to describe let's say It's Gonna Rain and Come Out and Piano Phase and Violin Phase and up through Drumming, but Music for 18 Musicians is already being stretched and when you get to Tehillim and Desert Music, it's no longer descriptive of the music. But, you implied something very interesting. Basically where the word "minimal" came from. It came from the visual arts. Because before myself and Riley and Glass, etc. became known, there were painters and sculptors like Frank Stella, Salowitz, Donald Judd, etc. who were doing what was called "minimal art," which was painting and sculpture with a very strong geometric bent and primary color bent. Some of these artists have become very, very great artists indeed. It's customary in music history, starting with the Baroque period which is basically a painting and sculpting term applied to music, and then the impressionists Debussy, Ravel, Satie somehow grouped with Monet and Renoir, later expressionists, Schoenberg, Berg and Webern some- how associated with the German expressionists of the time. This is a common effect, to take terms from painting and sculpture and apply them to the music of the period. So minimal- ism is updating that same phenomenon. Yeah, that is basically a good way of thinking. The idea that if you pursue any one thing in this world and you really get into it, you're going to find the universe there. You find that in religious thinking, and you'll find that in philosophical thinking and it's true. Whatever you pursue, if you really begin to pursue it thoroughly, and you really get into many, many aspects of it, instead of dealing with "one" simple thing, it flowers out and blooms and begins to get into areas you never would have imagined were possible to get into.